Venus is lovely in the spring. The Old Venus, that is. You know, the steamy, swampy Venus of the SF pulps, with its web-footed Venusians (Venerians), teeming jungles, dinosaurs, and those infamous dens of inquity in Venusburg. The Venus of Leigh Brackett, Edgar Rice Burroughs, Roger Zelazny, C.L. Moore, and Isaac Asimov. If you enjoyed OLD MARS (our Locus Award nominee from last year), you'll like this one even better, I think... and there's one story in there that's so bloody good that if it doesn't win the Hugo and Nebula both, I'll count it as a major injustice. Which one? Ah, I will leave you guys to figure that out. But first you'll need to read the book. March 3. Mark the day on the calendars. I'll meet you on Venus. I am sure Rowling is very busy. Not being able to show up for the awards ceremony is perfectly understandable. But she should at least have designated someone to accept on her behalf. i remember reading my father's SciFi collection. I had haunted images of what space looked like before i finally learned how boring these planets are. This gives me a sense of justice that imagination still exists within a scientific community. Ok I know this is unrelated but I can't help but comment... OMG "The Mountain and the Viper" ending!!!! I knew it was coming from reading the books but I'm still scarred for life. Seeing it brought to life was incredibly powerful and the fact that it was so effective (like the Red Wedding) is a testament to how well constructed the narrative is. I did, in fact, read & enjoy OLD MARS. I can't wait to do the same with OLD VENUS. There's something about the old school sci-fi that makes me so happy. I've only been following this blog for 3 years. But it seems like you've been putting out a ton of material lately. Would you say 2013-2014 has been one of your more productive times in your career? Heading for the swamps as soon as it comes out. (And seeing if I can get a oopy of Old Mars now...) Thank you for mentioning it! This new "old" anthologies seem really great. I'm wondering if there are specific stories or novels they are inspired by. You mentioned some author names. What works of theirs specifically led to these? Burroughs: Carson Napier series or Amtor/Venus series. John Carter clone. Has pirates! Brackett: Various Venus novels in the "Solar System" universe--e.g., "The Enchantress of Venus" and "The Stellar Legion" are two I remember reading. Asimov: "Lucky Starr and the Oceans of Venus," juvenile novel I remember thinking was rather, well, juvenile in comparison to the Foundation books when I read it at age 8. C.L. Moore: 3 or 4 of the Northwest Smith novels take place on Venus or have major Venusian characters. I never knew the "Old Venus" trope... I had always known Venus as the hell we know it to be today... deadly in heat, pressure, acidity... the hell that they now call in Star Trek a "Demon Class" planet. Truth be told I can't imagine how anyone could call that boring. Especially now that we theorize that before it's runaway Greenhouse effect turned it into a hell it may have had abundant water and maybe even early (single celled) life... it is after all in the goldilocks zone, along with both Earth and Mars. Personally, I think a modern Venus time travel story could be amazing... heck one could even run with the "there may have been life" thing and take that somewhere further. A story featuring jumping between a verdant past and its current nightmarish form, perhaps trying to avert the planetwide disaster that made it what it is today. Maybe a story about alien colonists settling in or experimenting with the world, lovecrafting cosmic horror style... or hell just go old trope and make the Venus of hundreds of millions of years ago "Old Venus" swampy and balmy, it could work. Another thought, and something modern scientists consider is that perhaps there may be remnants of Venus' earlier life still living high in the clouds above the heat, pressure, and acid. While they figure it unicellular one could conceive of terrifying flying or floating beasts, perhaps malevolently intelligent, even creepier if they still had some sort of inherited memory of their home's original form. Perhaps as part of the above time travel story. Or even a similar story told in flashback from a mind meld or mind scan of a captured creature by future scientists in a lab floating above the clouds. That said, future tales about a terraformed Venus are great as well, and plausible. After all it IS in the Gzone and it does have Earth gravity. Indeed, my primary experience of Venus in scifi is Ray Bradbury's short story about a rainy terraformed Venus and children marveling over the sight of the rarely seen sun. I suppose I like to keep my scifi as "hard" as possible... but perhaps it would be nice to see how people thought of it before we knew... it just seems like the possibilities based on the reality could be wilder and more fascinating than what we used to imagine. Will it be available as e-book on Amazon? About 7 years ago, my collection of Golden-age sci-fi paperbacks was obliterated by a flood. Many, many Asimovs, Dicks, Clarkes, Bradburys and a couple of anthologies just like this one all washed away. Seeing this just brings back how much I miss them. May have to order this when it comes around. Ah... I rather doubt it. TBS, Orson Lannister does not exist in the books. I read the Old Mars collection after hearing about it here on your blog, and I must say that I really enjoyed it. I also enjoyed the forward you wrote, which induced me to read some Edgar Rice Burroughs, and Kim Stanley Robinson's Mars trilogy. Looking for more sci-fi, I'm now into Orson Scott Card's Ender series. Thanks for the reading suggestions! Keep the anthologies coming! I buy them all. This one looks great, too. I haven't actually finished Old Mars yet, but I've got time before OV appears. Why isn't there a Steve Sterling's story in this anthology? I loved his story in Old Mars, and I love his Lords of Creation duology. 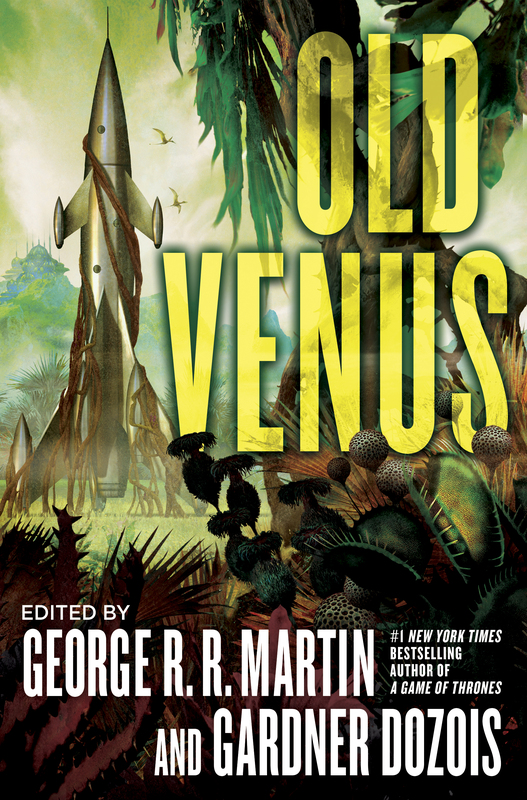 I see you have a story by Joe Haldeman in the Old Venus collection. Makes me more determined than ever to buy it. OLD VENUS is all original. Loved the Old Mars anthology. But based on that author list, I'm even more excited for this one. Especially looking forward to the Garth Nix story; have been re-reading some of his books recently and am looking for more. Hello Mr Martin. I love books. And I¨ve noticed I have become more wide about my day dreams and my expectasions of a real good book nowadays. My favorite authord is David & Leigh Eddings, Roger Zelazny, Jean M auel and Margit sandemo - all who creates fantasy books. Who is your favorite? And why? I quite often measer peoples fantasy due to their intelligence. These fantastic authors also puts in a little history to their telling, I love that. Also, it happens very often that I love books from authors that puts great value to animals and gardening. Maybe its a mirror like thing. Uncauntions meenings perhaps. If you could choose the "One book" that changed you the biggest, in a philosophical way of living, what would it be? Love the series too, by the way. "One book that changed me" would either have to be LORD OF THE RINGS or THE GREAT GATSBY. What really got me into fantasy, two books that aren't in the genre: A DISTANT MIRROR and THE NAME OF THE ROSE. Have you read Umberto Eco and if so, what do you think? Both sucked me into Medieval History and I never left.